What is it with the weather of late? It’s the last month of spring when the sun should be shining .......yet it is raining buckets and cold enough that I am still wearing a scarf and my winter jacket! Spending the day inside avoiding the rain, it was inevitable that I would head to the heart of my home....the kitchen. But what to cook??? Heading outside in the downpour was the last thing I wanted to do. 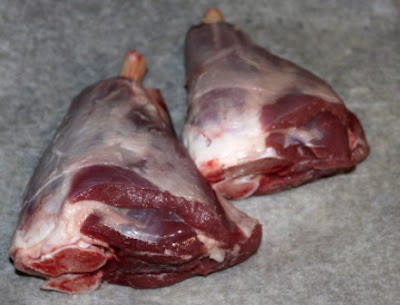 I then remembered I had some goat shanks in the freezer, that I bought from the Ellesmera Meats stand during a visit to the Leura Markets a few weeks ago. Goat is widely consumed around the world including Italy, Greece, Spain, Portugal, Middle East, North Africa, Central and South America, South East Asia, Polynesia and India. With our growing ethnic diversity goat is starting to be consumed in Australia, however we should embrace it more often. Goat meat is lean, and free range. As the goats feed freely on the grasses of the farm they are raised onm this gives the meat a delicious mild gamey flavour. 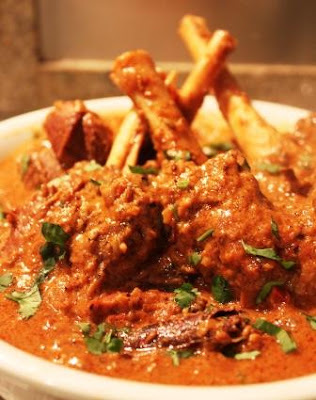 Goat can be roasted, grilled, braised and even barbecued....perfect for whichever cuisine you want to travel to. Today I wanted to travel to India. So I created a fragrant, slow cooked curry where the goat meat just falls of the bone and my mouth tingles with a cornucopia of spices from my spice drawer. Next time you see goat at your local butcher, or farmers market, buy some and explore. Heat oil in a large stockpot over medium high heat. Cook shanks, in batches, until browned all over. Remove and set aside. Reduce heat to medium low. Add onion and cook, stirring, for 10 - 15 minutes, or until golden brown. Add garlic, ginger and cumin, fennel, pepper, cloves, cardamom and cinnamon. Cook, stirring, for 2 minutes. Add tomatoes, ground coriander and chilli and cook for 3 minutes. Add yoghurt, water, salt and brown sugar. Bring to the boil. Reduce heat to low. Simmer, covered, for 2 hours, stirring occasionally, or until goat meat is tender. Stir in lemon juice and season with salt and pepper. Garnish with fresh coriander and serve with spiced basmati rice.